Remember when I thought it would be a good idea to have my home office in my dining room when we first moved in this house? Welp. I was wrong about that. Very wrong. Here is a cleaned up picture of the office dining room. It looked this nice for about 2.4 seconds while I took this photo. And then the crap piled right back up in this room so fast it made my head spin. 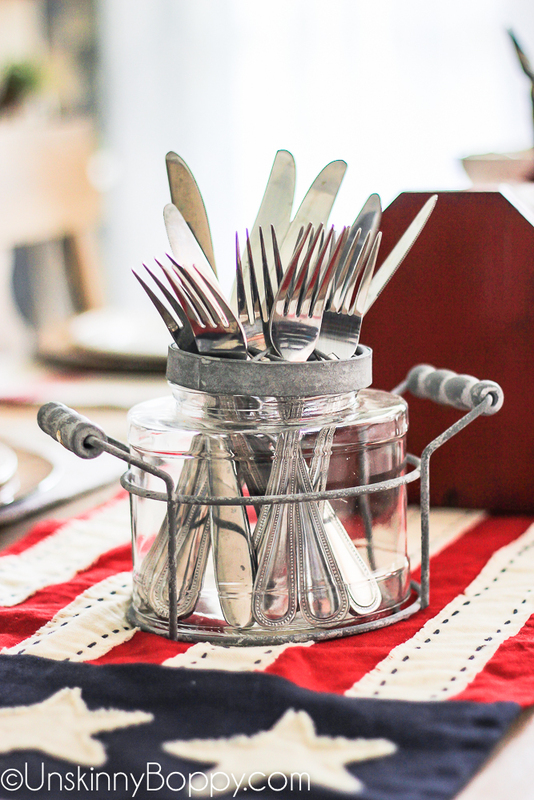 The dining room is the very first room you see when you walk through the front door of my house, and my office desk was continually covered in piles of paperwork and stacks of bills and towers of dirty dishes. It was not a good first impression. It never, ever felt presentable. So, I moved my office upstairs to the attic and reclaimed my dining room as a place to sit down and eat again! 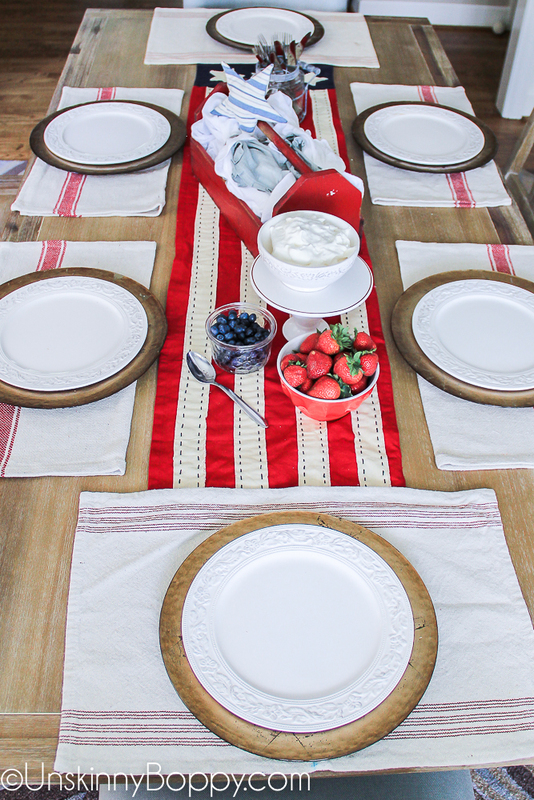 I’m SO excited to show you the finished room today along with a patriotic 4th of July table decked out in red, white and blue. Come take the tour! I bought the ‘Bradding’ dining table with a matching bench and two side chairs from a going out of business sale at a local Pier One Imports. This is the very first time I have ever owned a six-seater dining table!! WHOOPWHOOP. Look at me being all adulty and stuff. I also got the matching sideboard. 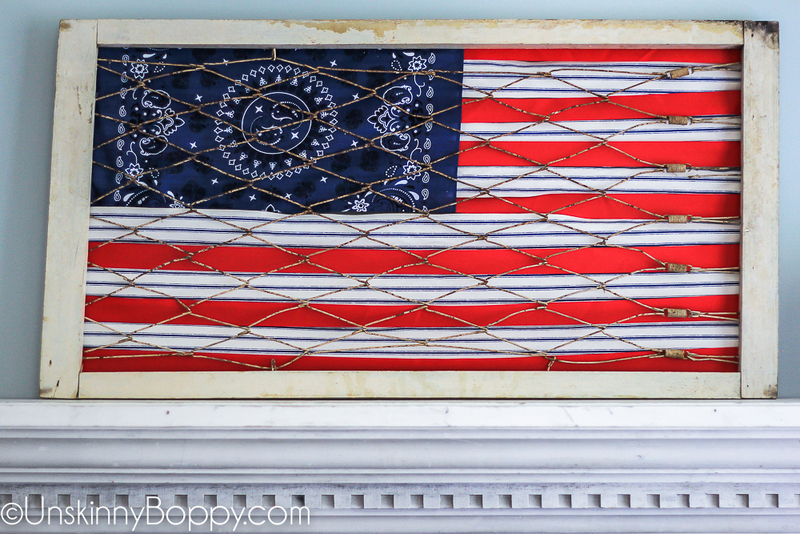 I found this old fireplace mantel at a local junk store and my husband attached it to the wall above the sideboard. It’s been sitting out in my garage gathering dust for over a year, but finally it found a home. It is perfect for this spot. It was so easy to create and it turned out so great. 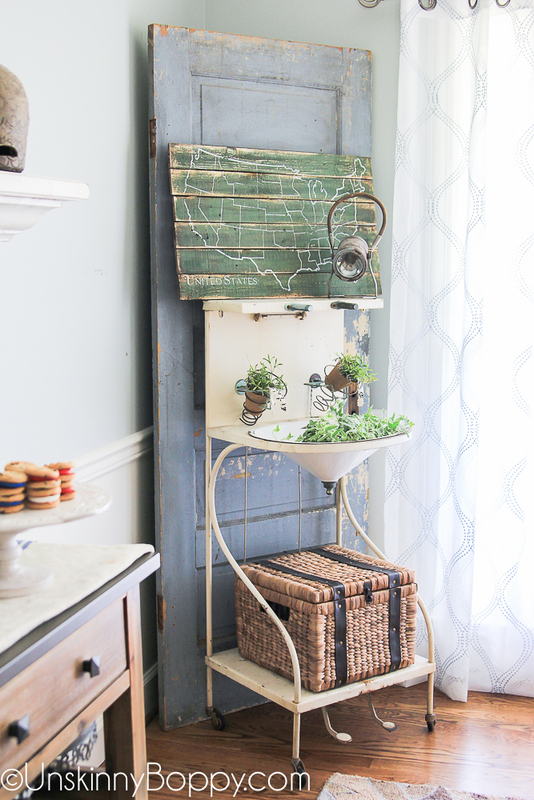 I found this green painted map of the US at Farmhouse + Family for my corner display. Thought this was perfect to celebrate America’s birthday. I have an addiction for junky old stuff. But y’all already knew that. I thought it would go away after a while, but so far it’s still hanging in there. So, back to the reason for this post. 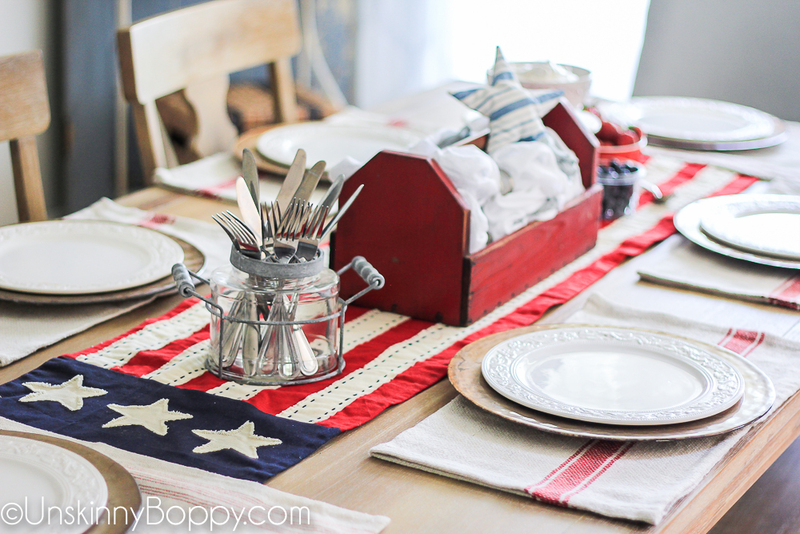 I used red striped dishtowels as placemats and a vintage flag table runner down the middle of the table. Simple white plates on gold chargers and boom. 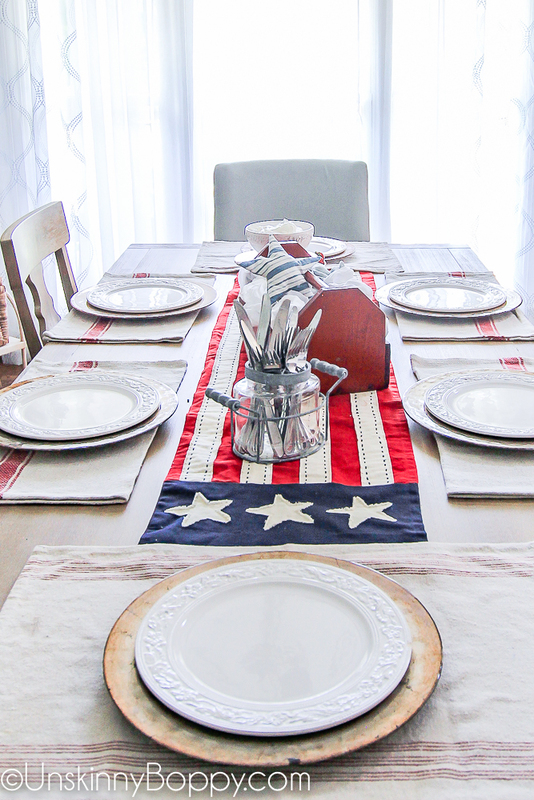 Table is set. I stuck the dinnerware in a glass vase with a galvanized flower frog to hold them up. 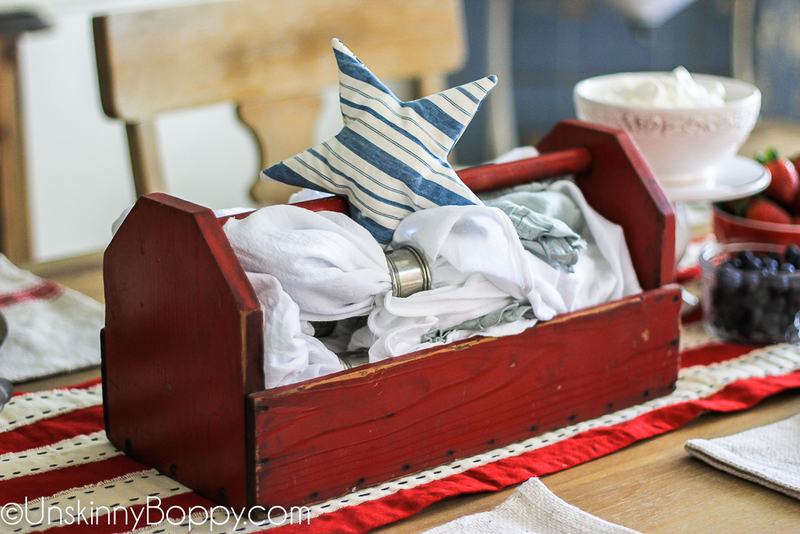 And added a red vintage toolbox to hold all the napkins. That pinstriped star sachet came from Dirt Home and Garden in Franklin, TN. 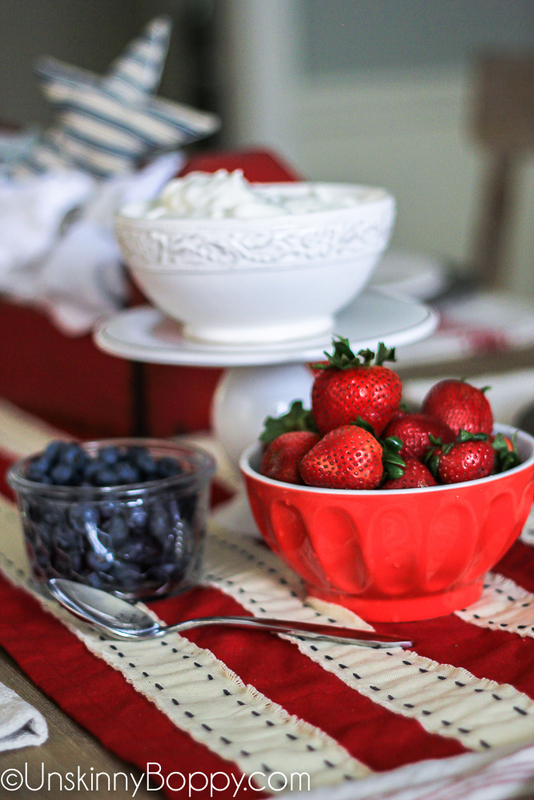 And there you go.. it’s a simple and easy Fourth of July tablescape! 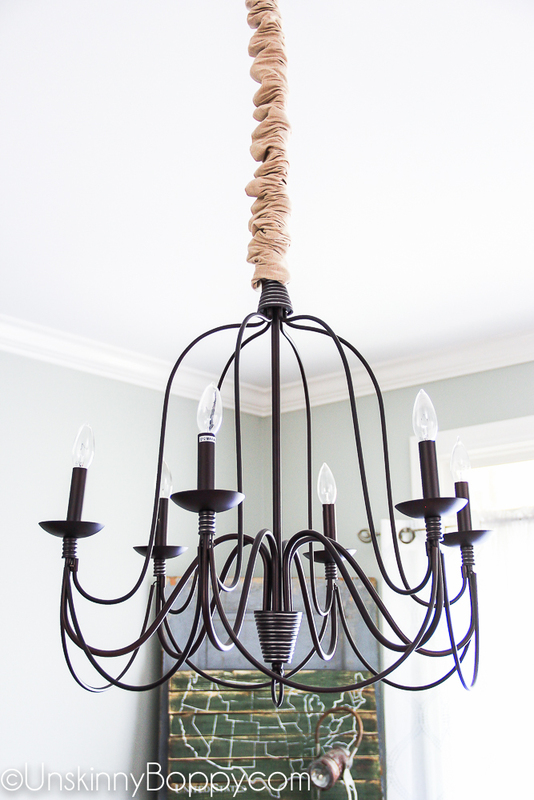 I finished out this room makeover with a brand new light fixture! Here was the old one that we replaced…. And here is the new one! I fell in love with Zevy Joy’s dining room chandelier, so I scoured the internet to find one like it. 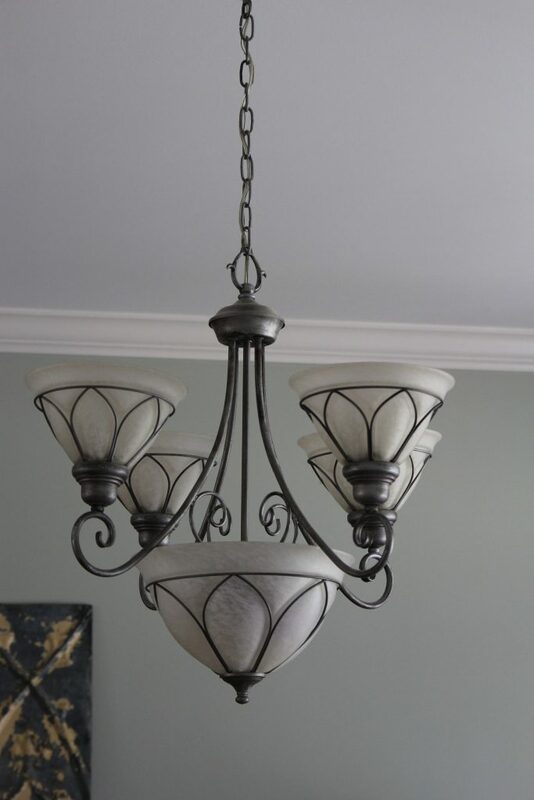 She told me hers is the Armonk chandelier from Pottery Barn, but I found this knockoff one on Amazon for WAY cheaper than the Pottery Barn price. I’m soooo happy with this pretty light fixture. I hope you guys have a great Independence Day! If you need me I’ll be over here shooting fireworks and making goo-goo eyes at my pretty new dining room table and light fixture. 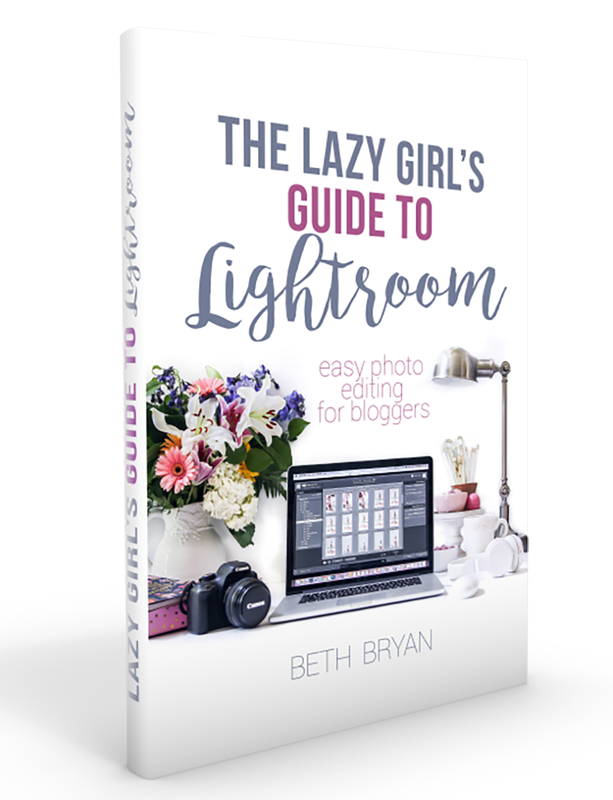 Here are my affiliate links if you want to shop for the looks in this post for your home. There is just so much to love about this! Lots of visual interest! And the flag and the US sign are perfection. Good work! 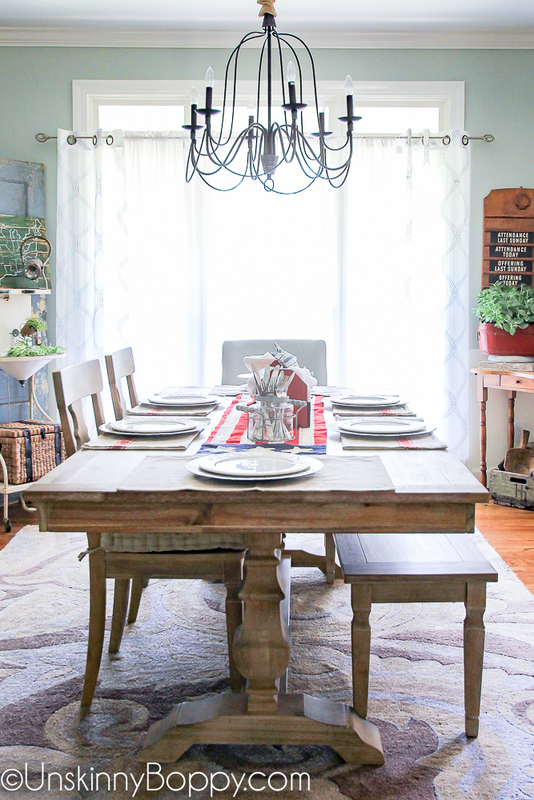 Your whole dining room looks awesome, Beth! 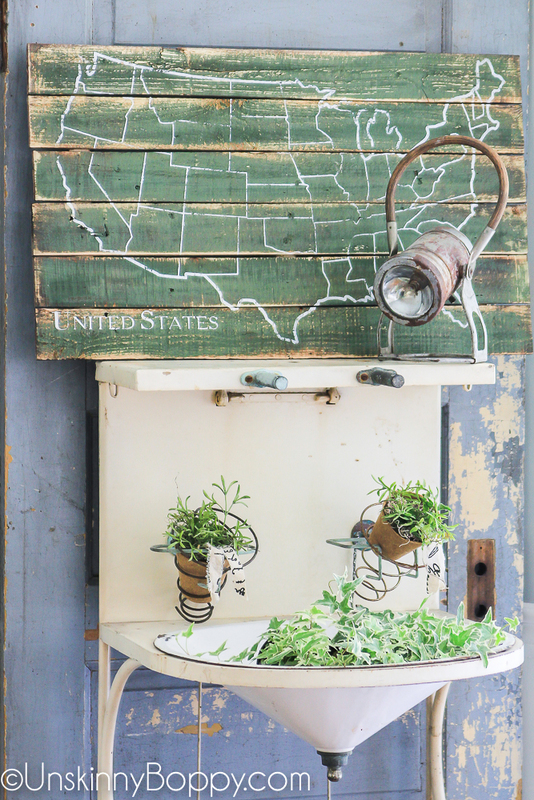 I love all the subtle patriotic touches, like the chalkboard America map! So pretty Beth! I’m loving all the decor in this room. 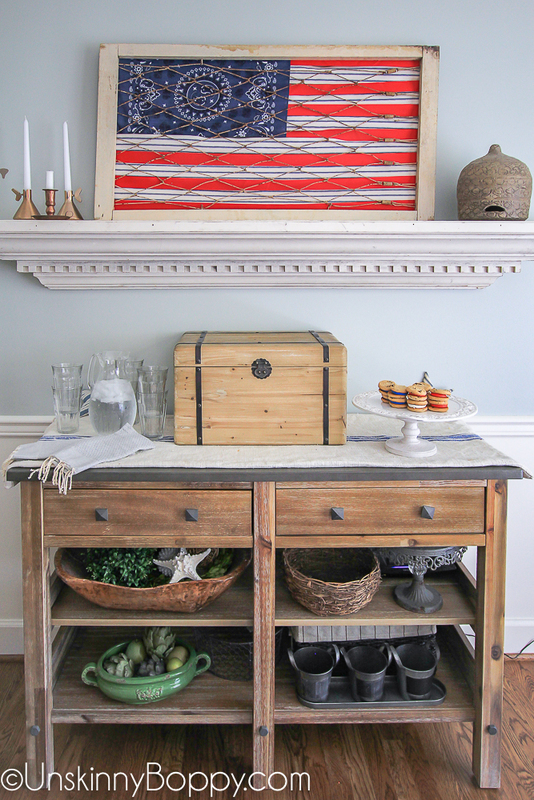 Such a pretty space, and love your patriotic touches. 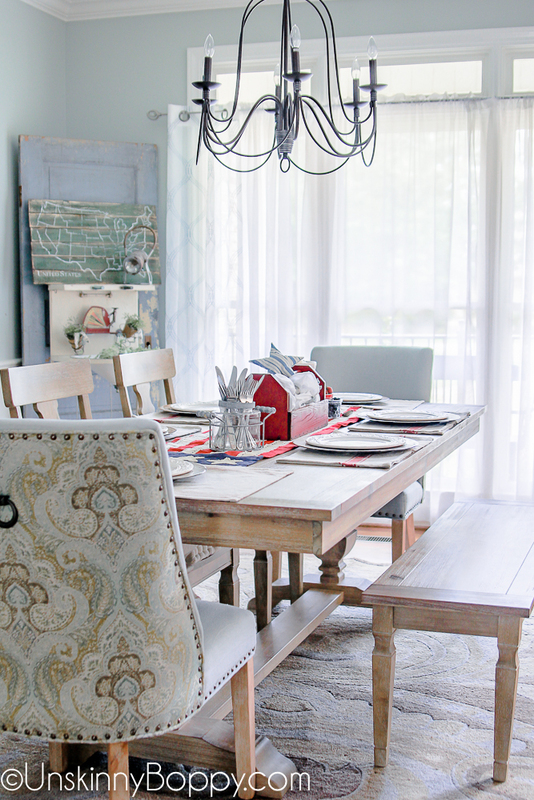 Did you use Sherwin Williams Rainwashed in your dining room? Beth, I love your new dining room! It’s just beautiful. 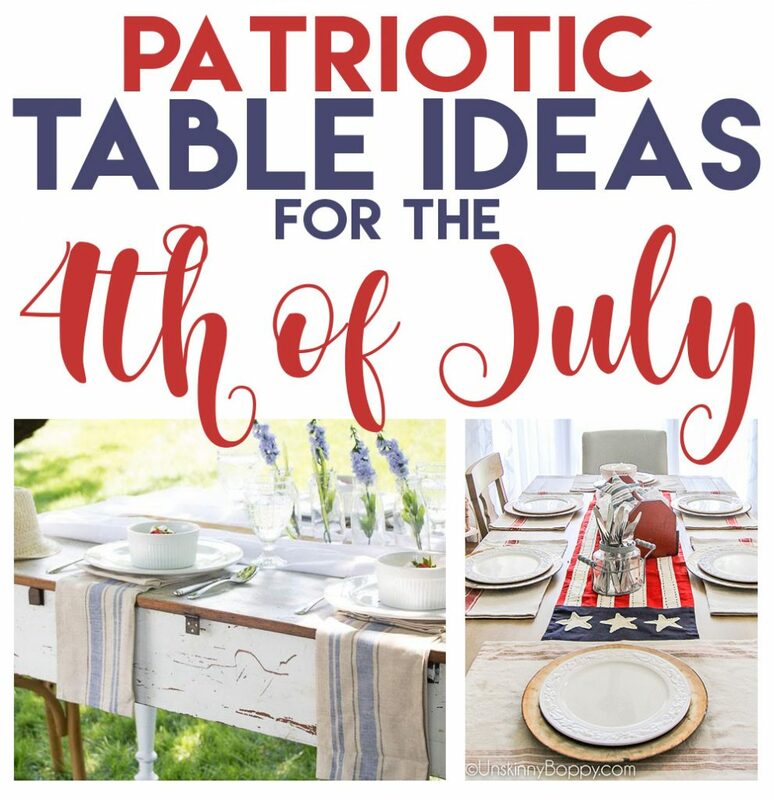 And I can’t wait to see your tutorial on how you made that flag with a crib mattress springs! Thanks Laura! That flag was SOOOO easy! 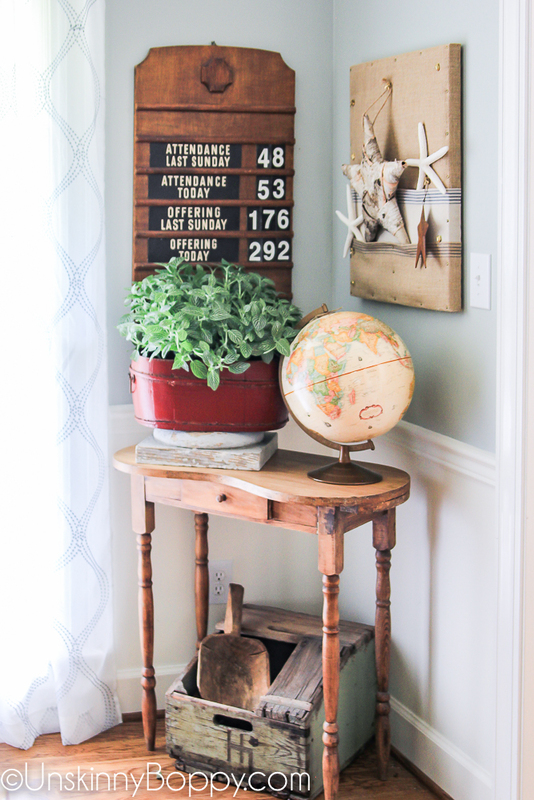 I’m sharing the DIY tomorrow! Beth, your table is gorgeous! 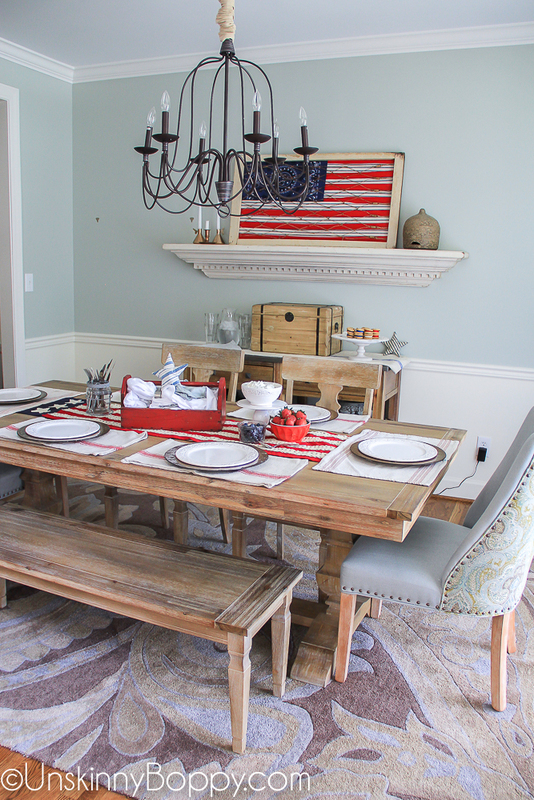 Well, your whole dining room is gorgeous but I love how you used the wooden tool box in the center. 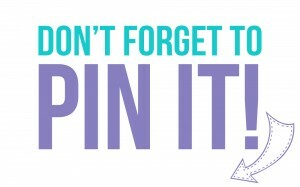 Your new chandelier is perfection! So thrilled I could be apart of such a talented group of ladies! Fantastic!! Love the room, and as always, your unique touches. Can’t wait to see it decorated for other holidays, too!! I love that you used those dishtowels as placemats! 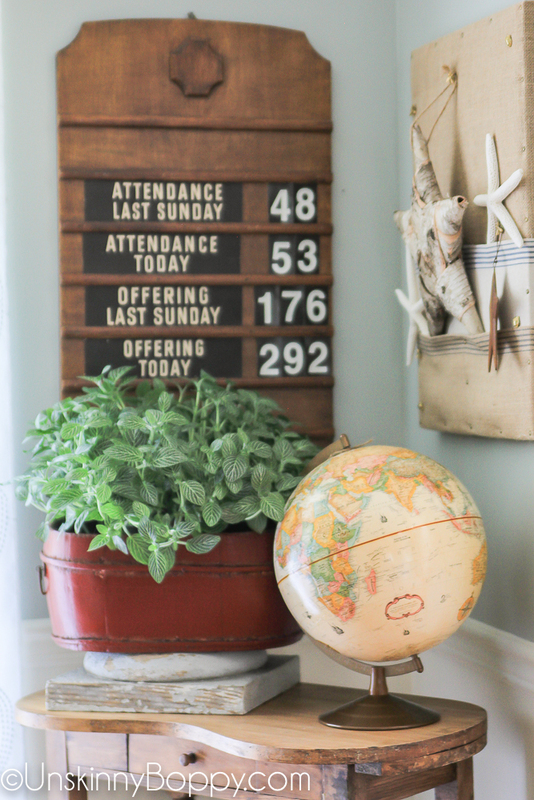 And that flag wall hanging is amazing. I think I need one. I love your whole table, it looks amazing! Hi there! Found this post while researching the Pier One Bradding extension table. 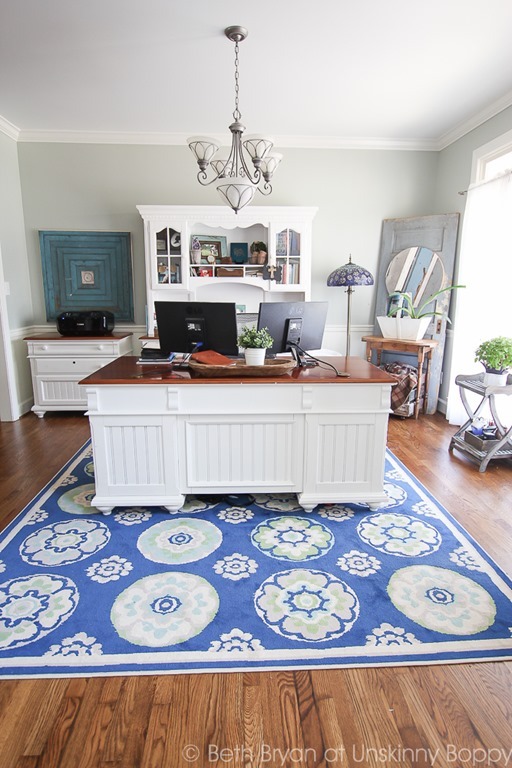 We looked at Pottery Barn Banks Table and a few other places but really liked the look and price of the Pier One table! Would you buy it again? How is it holding up? PS..looks beautiful!! Great style! I know this is an old post, but I’m hoping you’ll still get this question. Can you tell me the length of your table and bench? I know they have a 60-something inch table and a longer table in the Bradding Collection (I want to say 80-ish inches?)…. and was wondering which size table you have here? I love the bench-table combo! It’s hard for me to decide on the length. I’d like to be able to push the bench under our table. Are you able to do that with yours?